The blog's not really "mine", but a collaboration with some folks (see this and this) who are mainly in Hyderabad (India), one of the traditional homes of the Urdu language. I was just saying, on the Urdu-ke-naam blog, that the word (or trope, or concept) of Sanam (ثنم) is often used in Urdu and Persian poetry and is some times translated to "idol". In the humble opinion of this فقیر (Faqeer, if you will), just by itself and with no elaboration, that is a rather basic translation of the concept. PS: I have also posted a translation or two from Urdu poetry there. Take a look. A key issue of our time is the relationship between Islam and the West. But, tired of Islam-bashing, Muslims have largely tuned out the West. 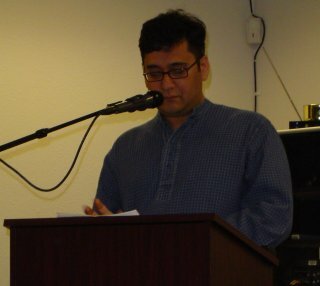 It is self-delusion to think that the West, America in particular, can dictate the terms of this debate, let alone pick Muslim thinkers in our own image. Yes. But it is an even greater and more dangerous delusion to think that the West, America or even one or other "internal" Muslim groups can't get into the mix and have a large influence; directly or indirectly. In fact, especially in the latter case, they already have, haven't they? Just my first knee-jerk reaction. More later, if I can. See previous post for the latest on Tariq A. The first 10 messages that Father Kukah received in commiseration on the death of the Pope were from Muslim leaders. Nigeria! What else can I say?